‘If You Wait For Me’ sums up the album perfectly. From its grandiose opening where a blanket of keys promises a huge pompy take on a classic sound, their commitment to the 80s is more than clear. 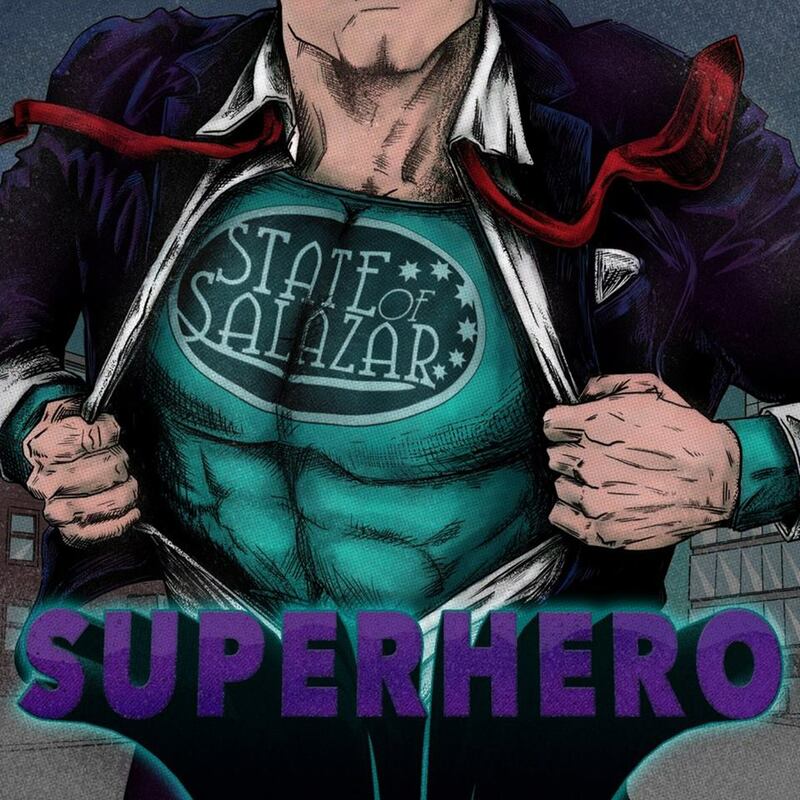 By the time the main melody presents itself, a tune driven by muted guitar chords has a classic AOR sound with all the makings of one of State of Salazar’s finest compositions. As the number progresses, various other 80s influences are uncovered, but it’s a huge chorus that really sticks. Marcus Nygren’s voice – as before – has a huge presence that takes a small amount of tuning in, but he’s well suited to this Scandinavian take on a US staple. …And that paves the way for the rest of the record – and ‘Superhero’ is a disc packed full of great songs. With a world of harmonies and more than occasional nods to the likes of Aviator and Survivor, ‘Hold On Tonight’ opens with a spritely riff before dropping into a verse full of punchy rhythms and great vocals. With everything appropriated from 1983, State of Salazar rarely sounded better. Nygren is in very confident voice, but for most fans, it’ll be the huge harmonies, a shamelessly retro keyboard solo and pomp-driven instrumental break that win out. In this love letter to a musical bygone age, the band really outshine most of their label mates and peers (with the probable exception of the marvellous State Cows). For those who loved the Toto inspired tracks from the debut, ‘Masquerade’ will certainly be an instant favourite with its David Paitch influenced stabbing keys, contrasting chunky guitar riff and chorus harmonies. The bulk of the number could’ve easily been lifted from the ‘Isolation’ album. With such a melodic backdrop, Nygren really excels in the vocal department, taking Toto-ish flourishes and injecting them with a rockier edge, but it’s guitarist Johan Thuresson and keysman Kevin Hosford who carry the weight and essentially make the track as brilliant as it is. The guitar solo is beautifully played and at the point you might think it’ll be the number’s best feature, Kevin drops in with a rather cheeky piano solo taking a jazzy influence from the Toto classic ‘Rosanna’ and completely steals the show. If you only need one reason to check out this elpee, then this is most definitely it. With a more buoyant quality, ‘Joanne’ is another sure fire favourite with the band taking on even more of those early 80s Westcoast elements from Maxus and Airplay, but once again recycling those much loved sounds with slightly chunkier guitars. Thuresson’s playing is both smart and very natural; occasional arpeggios weaving beneath the vocal lend a very textured sound, but it’s with a brief solo his playing really shines, while a backing vocal echoing the lead on the chorus provides one of the album’s most fun moments. Alongside ‘Masquerade’, this is a strong contender for ‘Superhero’s finest four minutes. Dropping into a melodic 70s strut, ‘Someone I Know’ mixes pure AOR with a tiny bit of pomp to create a retro sound that showcases more fine guitar work, while a slightly bombastic vocal lends extra power. Much like ‘Joanne’, the band have fun with a backing vocal and while everything is purposely derivative of Toto and Airplay, it’s just as much fun for the listener. Sometimes over familiarity works towards the positive and that’s definitely true in this case. Elsewhere, ‘Love Will Find A Way’ pays gentle tribute to Christopher Cross and Peter Cetera with a softer number augmented by saxophone; the massive ballad ‘Lie To Me’ pushes guest vocalist Kristina Talajic into the spotlight while State of Salazar invoke their inner Steinman; ‘She’s a Loaded Gun’ seems fairly formulaic but wins out due to some classic sounding keys, huge chorus and occasional melodies that sound like an 80s TV theme, and bringing purer AOR magic without necessarily breaking new ground for the band, ‘To The Wire’ pleases with a hybrid sound that offers Toto’s late 70s pomp with the smoothness of Pages. The tried and tested style provides a great base for guitar and keyboard solos and Kevin Hosford’s lead vocal spot is just terrific. Individually, these are solid soft rock tunes but when combined, each one adds a little flair to create a very consistent album. The eleven songs are pretty much flawless, so it’s a pity that a slightly muddy final master doesn’t always let the melodies breath as well as they should. Obviously, this kind of pure AOR with Westcoast tinges really deserves the kind of bright and crisp production found on all the 80s classics (and the State Cows debut from 2010), but instead, it’s got the kind of slightly woolly and dense feel that so many of the Frontiers Records releases after 2007(ish) are cursed with. Obviously, it doesn’t help if you choose to listen to it after Survivor’s ‘Caught In The Game’ or Signal’s ‘Loud & Clear’… Aside from that, though, ‘Superhero’ is almost everything you’d want from State of Salazar: it’s got great songs, greater melodies and – just as importantly – a love for the past that’s so deep you can’t help but get swept along. Read a review of ‘All The Way’ here. This entry was posted in Album & EP Reviews and tagged frontiers records, melodic rock, state of salazar, sweden by Real Gone. Bookmark the permalink.